Visually, the 4.40 meter (14.4 ft) long Audi R8 e-tron is recognizable by its unique lighting solutions on the air inlets, front apron and sideblades. Its exterior skin, painted in Magnetic Blue, combines body parts made of aluminum and carbon fiber reinforced polymer (CFRP), such as the front and rear lids. Thanks to aerodynamic modifications to its cooling air inlet, rear spoiler, diffuser, underbody and sideblades, the drag coefficient (Cd) of the R8 e-tron is just 0.28. Its Audi Space Frame (ASF) is based on the multimaterial design of the V10 version, which is extended by a rear body module made of CFRP. Despite its low weight, the corrugated bulkheads that conceal the luggage compartment can absorb a lot of energy in a rear-end collision. The T-shaped battery is structurally integrated in the middle tunnel and is mounted behind the occupant cell – this location offers a low center of gravity and an axle load distribution of 40:60 (front/rear). The high-voltage battery is based on lithium-ion technology. 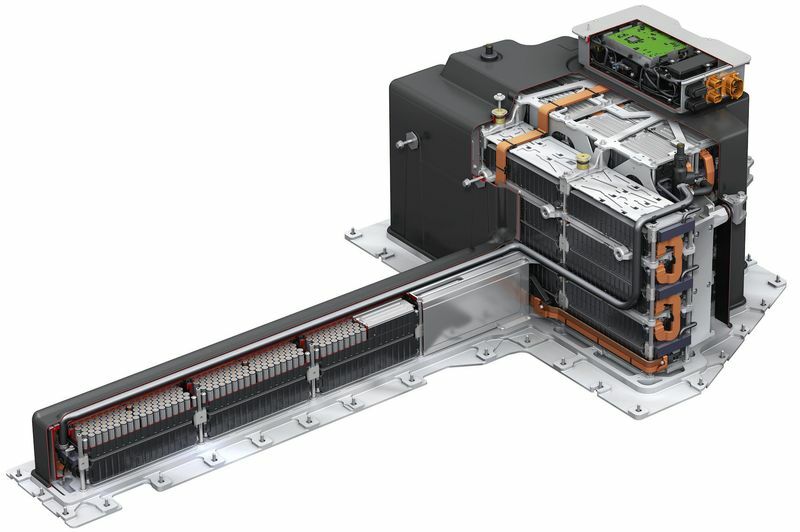 The liquid-cooled lithium-ion battery consists of 52 modules. Compared to the first e-tron technology platform, the energy capacity of the new 595 kg (1311.8 lb) battery system was boosted from around 48.6 kWh to 90.3 kWh without requiring any package modifications. 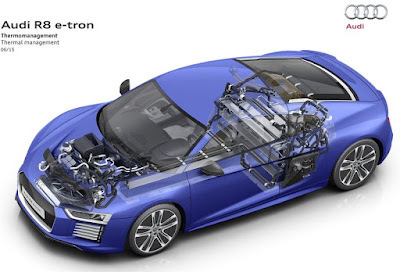 Thanks to the high energy density, which was increased from 84 to 152 Wh/kg, the R8 e-tron can be driven up to 450 km (279.6 mi) on just one battery charge – previously it was 215 km (133.6 mi). In the Combined Charging System (CCS) for charging with DC or AC electricity, the battery can be fully charged in well under two hours. The driver can control this process remotely by smartphone, if the user has installed the relevant Audi connect app. The two electric motors on the rear axle each output 170 kW and 460 Nm (339.3 lb-ft) of torque. The R8 e-tron, which weighs just 1,841 kg (4058.7 lb) empty (without driver), sprints from 0 to 100 km/h (62.1 mph) in 3.9 seconds and can accelerate to an electronically governed top speed of 250 km/h (155.3 mph) while developing its unique e-sound. Targeted Torque Vectoring – a need-based distribution of drive power between the rear wheels – gives the car maximum stability and dynamism. Intelligent energy management and an electromechanical brake system at the rear axle ensure high rates of energy recuperation. The suspension springs consist of glass fiber reinforced polymer (GFRP), and the anti-roll bar is made of CFRP. The R8 e-tron rides on aerodynamically optimized, high-gloss 19-inch aero wheels that were specially developed for this car. At the front axle, size 225/40R19 tires enable precise steering response. Size 275/40R19 tires transfer the torque of the electric motors to the road. The tires were specially developed for the requirements of an electric supercar, and they combine sporty driving properties with efficient rolling resistance values. Extremely sporty 20-inch wheels of the production R8 are available via the Audi Genuine Accessories program. In the finely crafted interior, the R8 e-tron offers illuminated door sill trims, folding bucket seats and a specially configured Audi virtual cockpit. A heat pump removes waste heat from electrical components for thermal management and for interior climate control – an important efficiency module of the overall concept. Audi also uses the latest development stage of the R8 e-tron as a high-tech laboratory – it also continues to play an important role in developing electric mobility of the future. The R8 e-tron will be produced in the small-scale production facility of quattro GmbH at the Audi Neckarsulm site in the Böllinger Höfe. 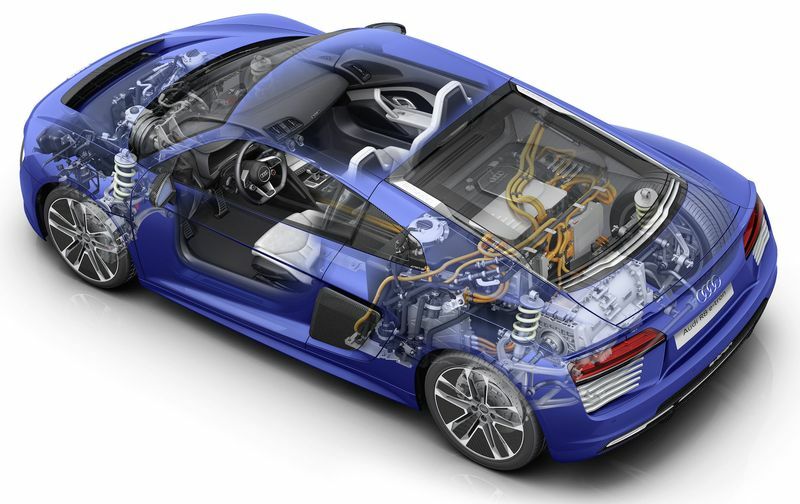 The new battery cells are primarily responsible for the new performance and driving range of the Audi R8 e-tron. Audi has systematically adapted its high-voltage battery system to the specific needs of electric cars – the primary focus was on achieving an optimal ratio between power and energy. The results: The R8 e-tron has a significantly longer driving range and even more power than the previous model. In developing the high-voltage battery, the brand with the four rings followed the principle of maximum flexibility without losing sight of synergies in electrification. 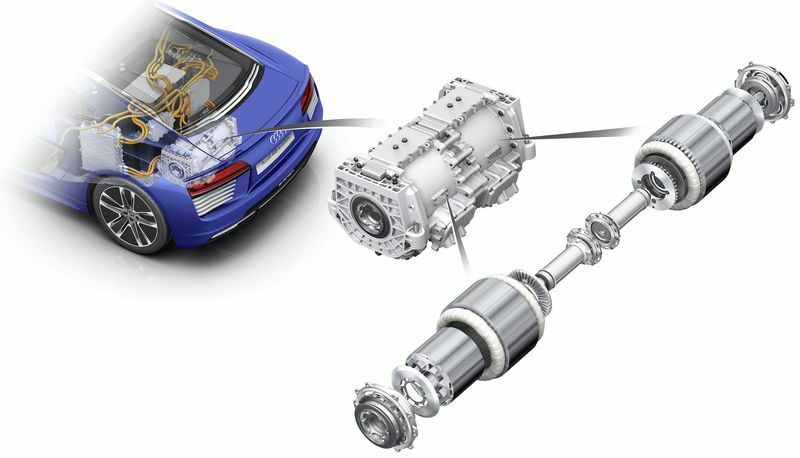 Its flexible cell module concept makes the Audi brand well-equipped for all future market developments, while the modular concept also guarantees Group-wide use across different car models. The battery operates with 385 volts of nominal voltage, and its new cell module concept achieves excellent performance. The battery’s energy density grew from 84 watt-hours per kilogram (Wh/kg) to 152 Wh/kg, and its nominal capacity from 48.6 kWh to 90.3 kWh. 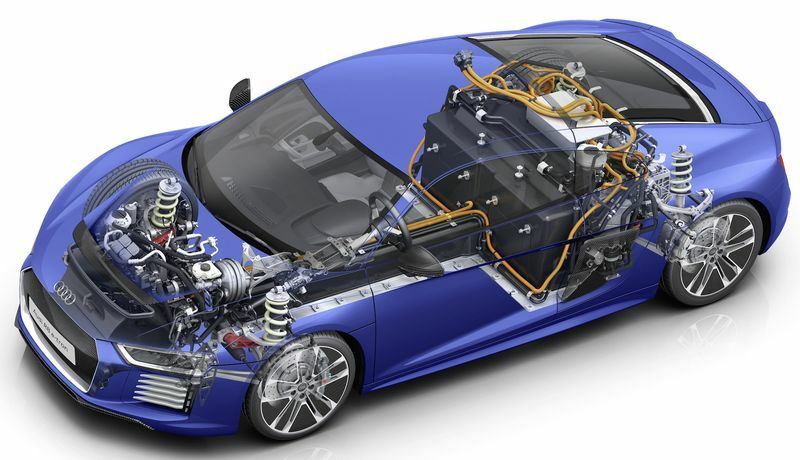 Its driving range on a full charge has more than doubled – from 215 km (133.6 mi) to as much as 450 km (279.6 mi). These values make Audi the leader among the competition. 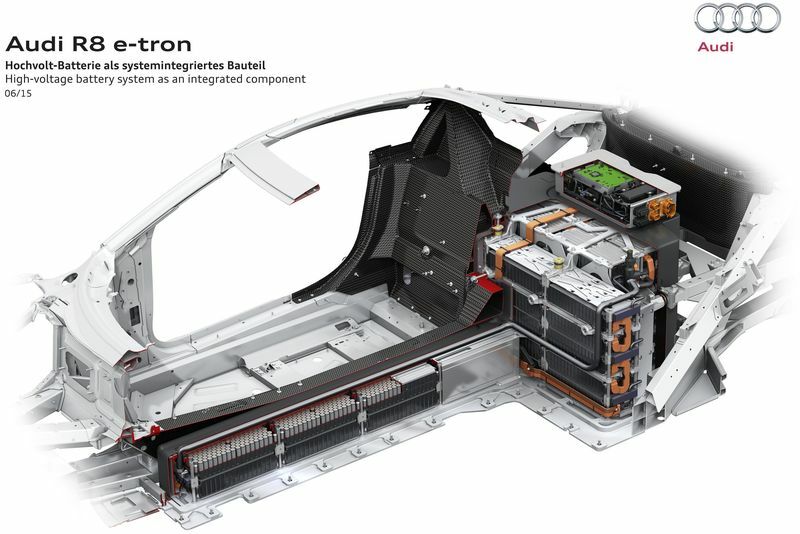 The battery system of the Audi R8 e-tron takes on the shape of a “T”. It measures 235 cm (92.5 in) long, 136 cm (53.5 in) wide and 70 cm (27.6 in) high, including the junction box on the cross-bar of the “T”. This junction box is responsible for monitoring, switching and transmitting an electrical current of over 1,200 amperes. 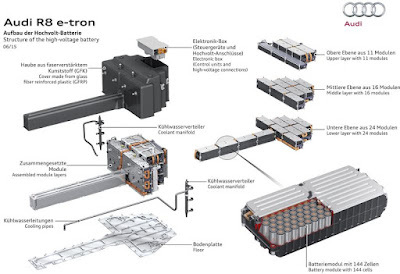 The highly complex battery system consists of over 10,000 individual parts. The 7,488 cells are packed in 52 modules of 144 cells each. Each module weighs 7.8 kg (17.2 lb). They are arranged on two and five levels (“floors”) in the tunnel battery and in the rear battery. Aluminum plates separate the “floors” from one another while creating the supporting structure for the battery. Coolant circulates in a cooling system of aluminum shells. 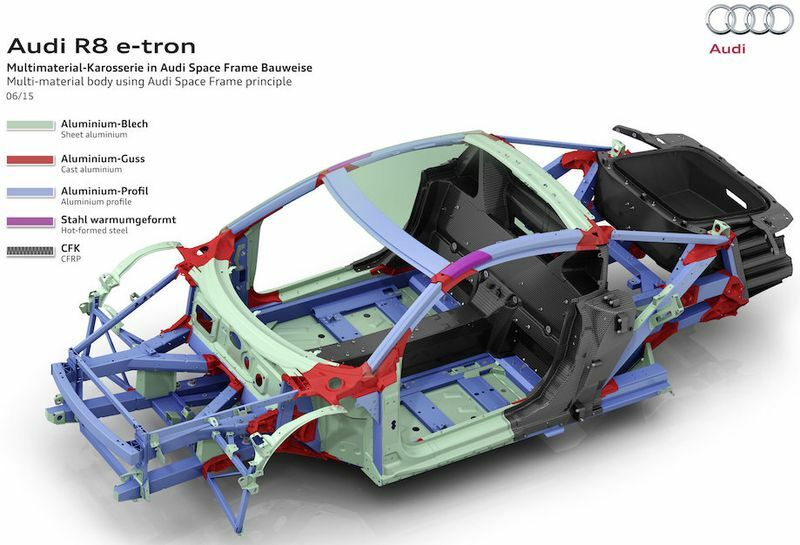 In a crash, high-strength floor plates and impact plates redirect the crash forces into the multimaterial ASF (Audi Space Frame) of the R8 e-tron in a defined way. The 595 kg (1311.8 lb) battery system is joined to the ASF with bolts in the middle tunnel and behind the occupant cell, making it an integral part of the vehicle structure. Its mounting position results in a low center of gravity and an axle load distribution of 40:60 (front/rear), which is ideal for a mid-engine sports car. The Combo 2 charging interface of the Combined Charging System in the Audi R8 e-tron enables charging with AC or DC electricity. When charging with AC from an industrial electrical outlet with 7.2 kW of charging power, a full charge is reached in just around 12 hours. Charging with DC electricity shortens the time – to just 95 minutes at a charging power of 50 kW. Audi is demonstrating charging equipment that can charge this battery system with up to 150 kW of charging power. For the driver of the R8 e-tron, this means that a driving range of around 150 km (93.2 mi) can be attained after just 15 minutes of charging time. The customer can manage charging remotely as well – using a smartphone on which the customer has installed the relevant Audi connect app.